Welcome to dhReno.com! We are a mountain bike club/team in Reno, Nevada USA. We love to race and ride mtn bikes and our main focus is to have fun! Our main outlet for info/photos/video has switched over the years from this blog to our Facebook Page which is now our primary news outlet. Please check it out. This blog still has plenty of interesting information, photos and video from all of our fantastic events going way back to 2004! Thanks for visiting and Enjoy! An effort is under way to build a Pump Track in Reno. It would involve reworking the underutilized BMX track at Panther Valley Park into three levels of Pump Tracks, a small jump line and some skill development features. TAMBA and the Poedunks have been working with the City of Reno Parks and Rec Department to make this happen. It has the support of Parks and Rec, and will go to the Ward 4 Neighborhood Advisory Board(NAB) on Monday, March 12, 2012 at 6pm at the Evelyn Mount Northeast Community Center at 1300 Valley Road. Attendance from the cycling community is encouraged to show support for this project. If it is approved at the NAB, it will then go to the Parks and Rec Commission for approval in April. Theoretically we could be moving dirt shortly afterwards and have this completed by the end of May. Here’s where we need your help. Please sign this online letter of support. And show up to the meeting on Monday to demonstrate your support. With your help we can make this happen for our community. Once we build one, a few more in other neighborhoods will be easier. 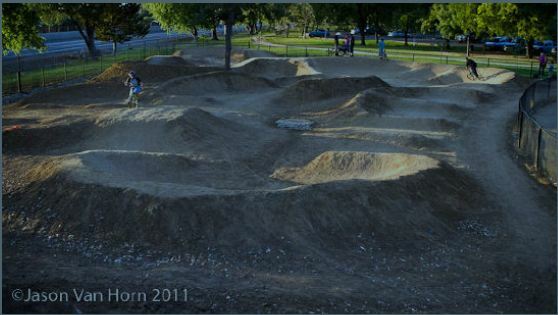 Wondering what a Pump Track is? See the pump-track-proposal.pdf. Don’t forget to attend the Pedal Driven Movie Screening on March 22 at CommRow. A good turnout will raise enough for TAMBA and the Poedunks to completely fund this project. Other donations would always be accepted as well. We need to come up with at least $500. Yep, that’s it. Signs made and installed, fuel for the borrowed equipment, a couple water hoses, and some lumber for the skill features. 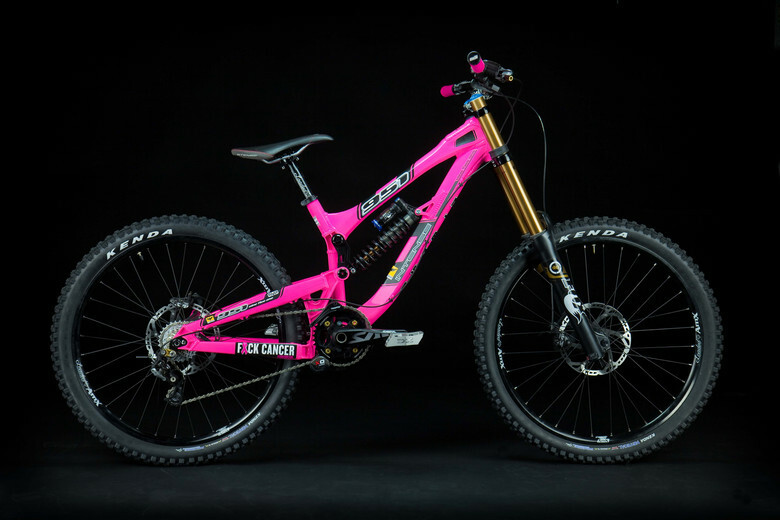 This small Pink Intense 951 is a unique bike, specially built to generate resources and raise awareness, to help cancer victims. The frame is a piece of industrial art, hand-built in the Temecula, California Intense Factory. We had it powder coated around the corner from our factory here, we picked the loudest, hottest color to really follow the initiative shown with the F~CKCANCERUP campaign. · LOADED donated the Bars, wheels, Stem and Seat post. · ODI donated the lush grips. · INTENSE donated the size small 951 frame, and did the rest. For every $5 donated by Midnight of 4-1-2012, you will earn one chance to win this bike and other prizes. So if you donate $25 that is 5 chances at a bunch of prizes. The winner will be selected from a magical spreadsheet using random.org.